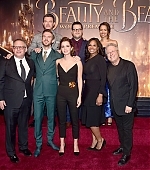 I’ve updated the gallery with 80 photos of Gugu attending the Los Angeles premiere of ‘Beauty and the Beast’. She wore an amazing Oscar de la Renta dress the premiere. Thanks to Maria from andysamberg.org for some of those.